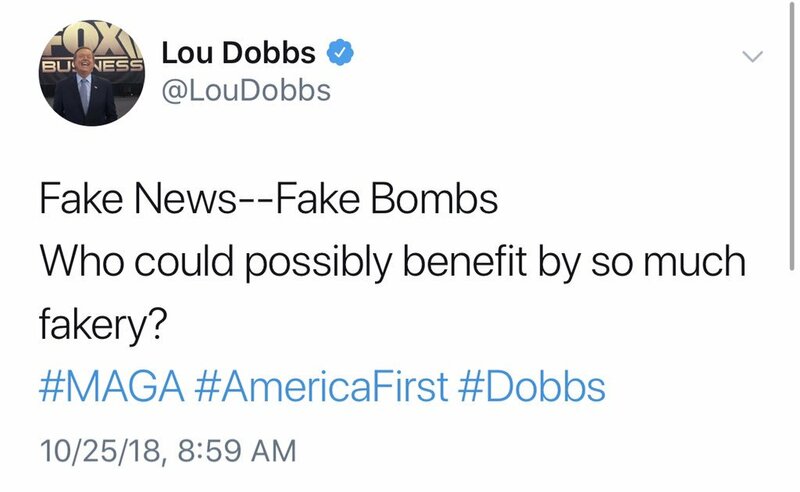 Dobbs also deleted a later tweet that claimed the "Fake News" changed the narrative from "the onslaught of illegal immigrants" to "suspicious packages"
Trump-boosting Fox Business host Lou Dobbs — who serves as an unofficial adviser to the president — deleted a couple of tweets this morning that claimed the pipe bombs mailed to multiple prominent Democrats and CNN’s New York offices were nothing more than a false flag. In his first tweet, the conservative TV personality added his name to the growing chorus of right-wing voices who are convinced that Democrats set up the mail bombs sent to two ex-presidents, a former attorney general, a sitting congresswoman and billionaire philanthropist, among others. For those who are unfamiliar with Dobbs’ extreme pro-Trump Fox Biz broadcasts, “Dimms” is his oh-so-witty nickname for Democrats. He has since deleted this tweet as well. In the wake of the bomb scare, which has expanded to former Vice President Joe Biden and actor/activist Robert De Niro this morning, a number of Fox News guests have brought up the possibility that this is all part of a false flag operation by the left to drive sympathy for Democrats. During one segment on Fox Wednesday evening, host Martha MacCallum replied with “fascinating” when her guest suggested Democrats planted the bombs to stoke fears ahead of the midterms. 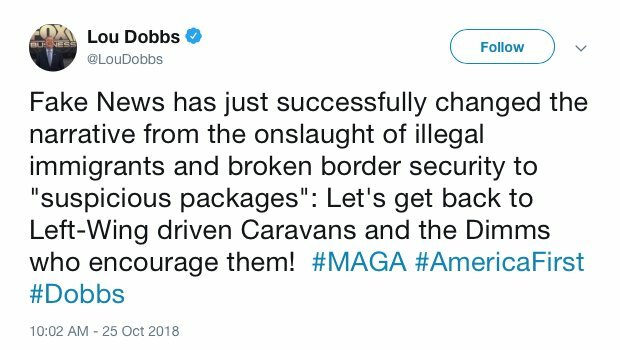 We have reached out to Fox Business for comment on Dobbs’ tweets and will update this post if we hear back.